Coopers rotisserie offerings. 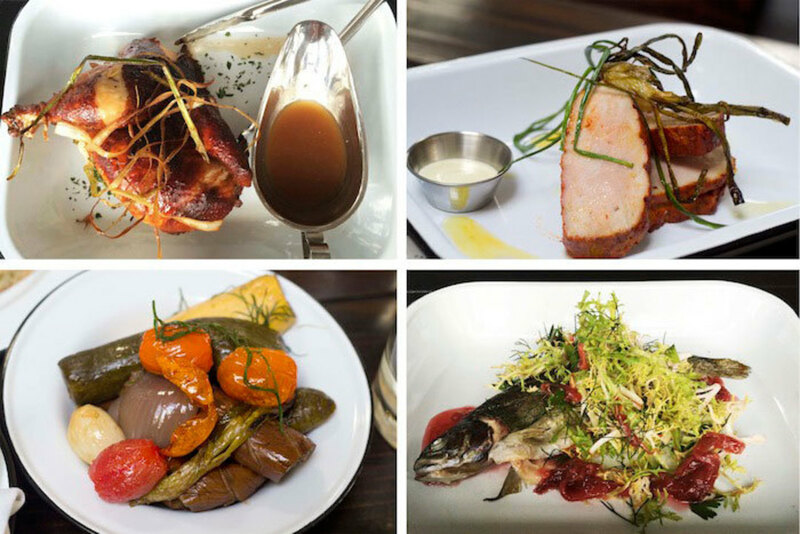 Clockwise from the top: chicken with umami glaze, achiote-rubbed pork loin, whole trout, rotisserie vegetables. Coopers Hall is big. Like, airplane hangar big. 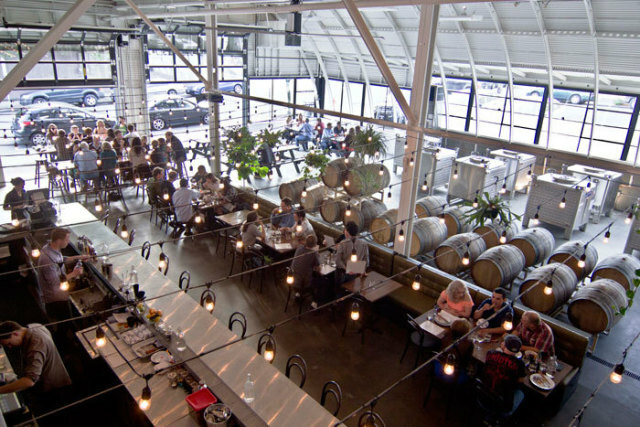 Swallowed up inside the titanic, 8000-square-foot urban winery on Southeast 6th and Stark Street: a bar the size of a runway, two stories of communal tables and leftover room for full-scale winemaking. Early visits at the month-old Chefstable project show a wine program with promise for the masses: unintimidating, with pours for every size and budget. But the food needs work, and the space, a personal touch. 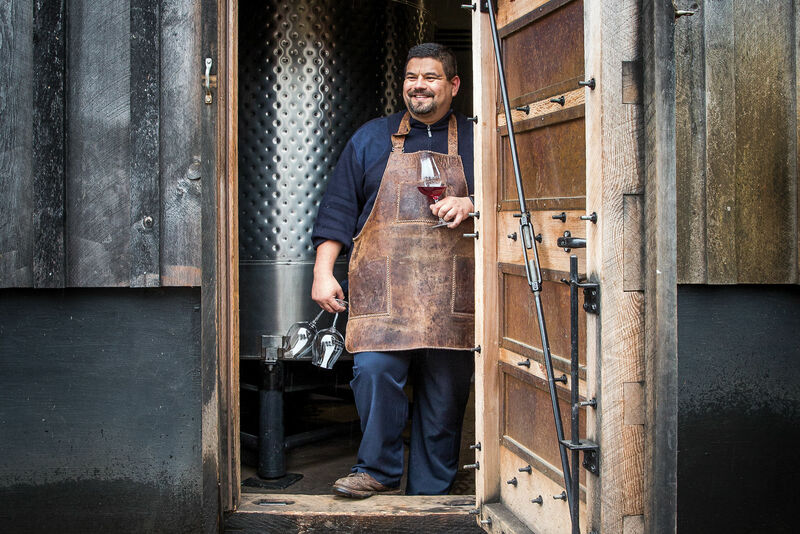 Coopers Hall is leading the charge in a growing “keg wine” revolution, thanks to sommelier Joel Gunderson and his extensive on-tap wine program, pulling 44 vintages from California to the Northwest. That means you can sample 2-ounce sips for $3 or share affordable full-glass pours from some of Oregon’s best indie wineries—if you don’t miss the art and romance of bottled wine. 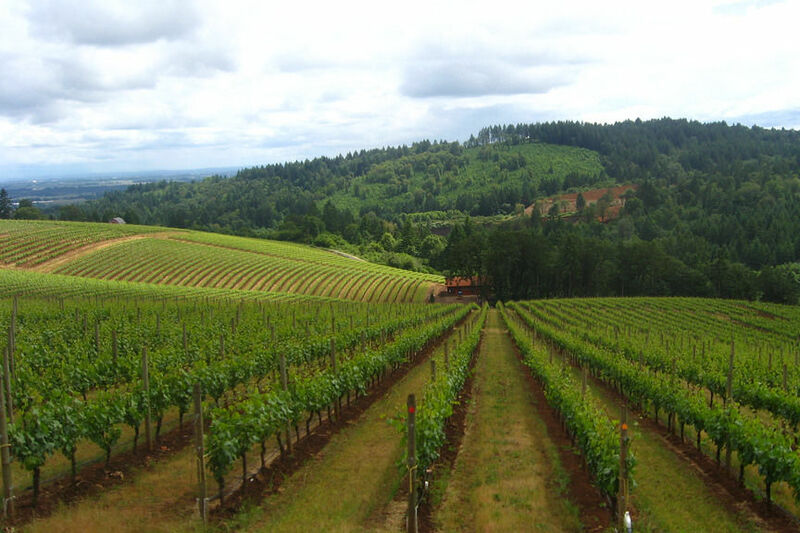 Coopers Hall is also the latest in a string of urban wineries, (wineries, detached from their vineyards, crushing, pressing, and bottling wine within the city) many of them nestled in Portland’s Southeast Industrial neighborhoods. 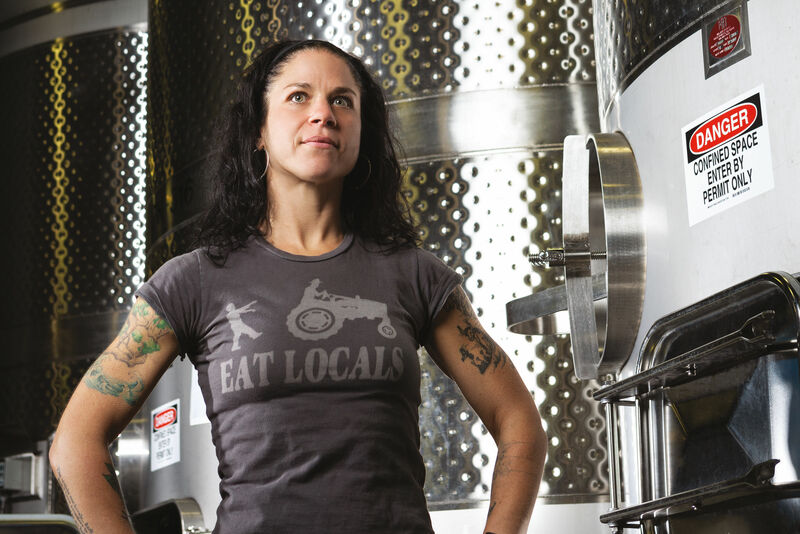 Chefstable owner Kurt Huffman partnered with Willamette Valley’s AlexEli Vineyards to create a Coopers Hall line of wine from Pinot Noir to Riesling. Cooper Hall's 8,000 square foot airplane hangar. Things are still shaking out, but the kitchen, manned by former Racion sous chef Roscoe Roberson, lags behind the ambitious wine program in both vision and execution. The concept is “rotisserie,” with four different animals in orbit. Is it a rotisserie joint if you can’t see your chicken (slightly dry) on the spit or smell the infectious perfume of slow-cooking pork tenderloin? “Fish,” a whole trout leaking rhubarb compote and looking unnervingly like fish guts, is missing the crunch of crisped skin. Meanwhile, “rotisserie vegetables” are flaccid and chewy, stagnant in a pool of vinegar sauce. If the 90’s-era Kenny Rogers Roasters chain could manage a great rotisserie chicken, surely Coopers Hall can, too. So far, the best bites between pours are the piping-hot chicken potpie ($9) encased in flakey, croissant-like dough or the crusty French bread served with butter-whipped schmaltz ($3). If size matters, try the Cow and Egg sandwich: a heaping pile of teres major steak, mashed potatoes, and gravy-soaked bread with a fried egg on top ($12). 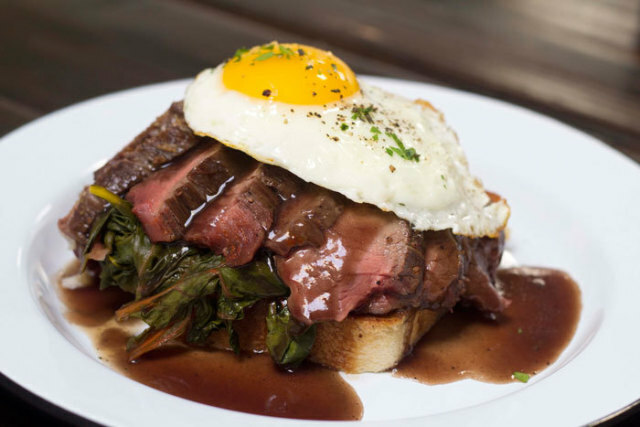 "Cow and Egg": Open face teres major steak, mashed potatoes, braised greens, gravy, and a fried egg. Off the menu, Cooper’s biggest shortcoming is its aesthetic, created in the increasingly prevalent image of Chefstable's Portland restaurant empire: a sparse black and white paint job, long communal tables with uncomfortable chairs, and branding dangerously close to the “fill in the blank” Hipster Logo Design Guide. Interior and ambiance are a big part of the dining experience, anywhere. Imagine Din Din without its charming, chandelier-lit open kitchen, or Ava Genes without its juxtaposing marble counters, firefly lights, and folk-art portraits. Chefstable has given Portland some of its best restaurants (Ox, Racion, and St. Jack, to name a few), but it's also propagating the city’s growing cookie-cutter template. 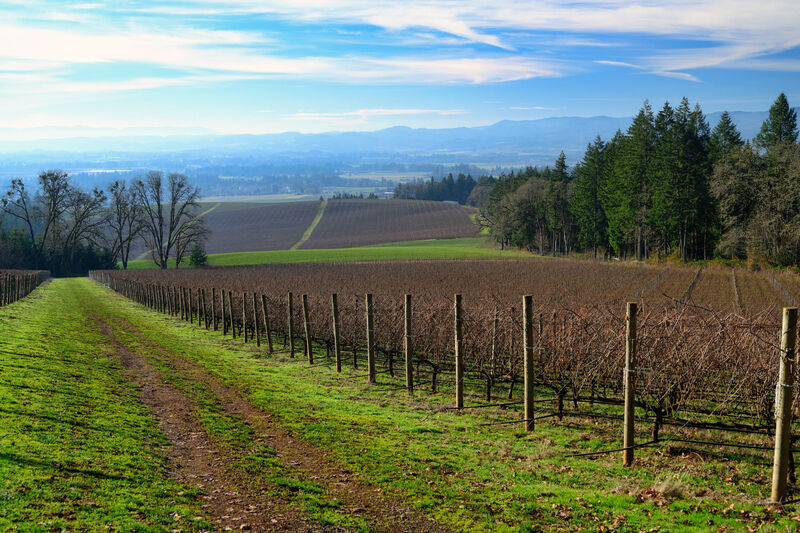 At its core, Coopers Hall is lowering the barrier between every day drinkers and Oregon’s prolific wine culture, and that’s a good thing. If the kitchen can find a way to match Gunderson's vision, we’ll drink to that.